Rugged, stainless steel, one-piece grips that will never crack or leak. Unique silicone muffler reduces noise. Focused irrigant delivery gets the coolant precisely where it’s needed. Parkell’s quality-control process assures spot-on frequency, tip oscillation and water flow. PLEASE NOTE: Inserts may not be returned if used or if package is opened. Tackle all scaling demands with reliability and comfort. Our all-metal Ultrasonic Inserts are precision-crafted with durable stainless steel one-piece grips. Built to last, these inserts will not crack or leak. They're fully autoclavable and specially designed for ease of handling and improved comfort. Each insert features a silicone muffle to significantly diminish noise, and has been thoroughly tested as part of Parkell’s rigid quality control process to assure consistent frequency, tip oscillation and water flow. These stainless steel inserts are compatible with most other scalers, and available in 25KHz and 30KHZ options. 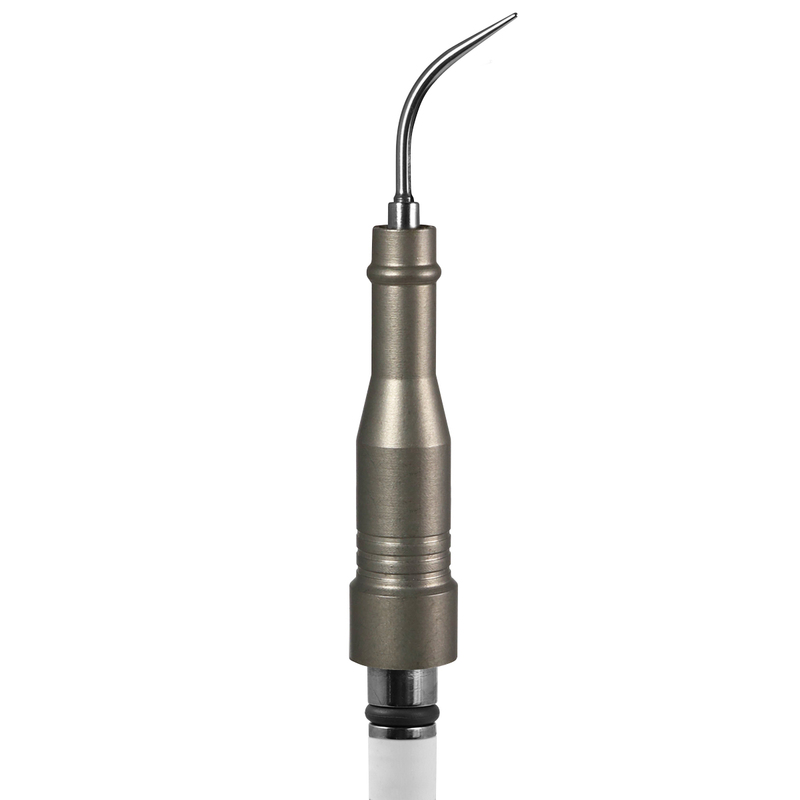 Marked by quality, versatility, value, and uncompromising durability, Parkell’s extensive line of precision inserts are backed by the company’s solid reputation of providing the dental industry with top-notch scaling equipment. PLEASE NOTE: INSERTS ARE NOT RETURNABLE IF OPENED. If necessary to return insert, please use a shipping box, not an envelope or padded mailer. Every insert is functionally tested by Parkell before packaging; therefore, some water residue may remain. Do not bend or reshape insert. Inserts should be handled with care at all times. Ultrasonic insert tips that have been bent, reshaped or otherwise damaged are susceptible to in-use breakage and should be discarded and replaced immediately. Make sure the insert’s green or black O-ring is in place before use, and lubricate with water prior to inserting into the handpiece. Replace worn or damaged O-rings with Parkell. During scaling procedures, all intra-oral soft tissues should be protected to avoid contact with the vibrating tip. To avoid gouging the tooth, keep the tip parallel to (not perpendicular to) the tooth’s long axis. Use a controlled wiping motion, with copious water irrigation. While Parkell “Universal” tips and “Burnett Power-Tips™” may be used at any power setting from “low” to “high”, thin “Perio-style” tips should not be used above your scaler’s “medium” power setting. Inserts must be carefully scrubbed to remove debris, either by hand with a brush or in an ultrasonic cleaner. Use non-ammoniated detergent or dishwashing soap, followed by a cold water rinse. Do not use ammoniated cleansers or disinfectants. Steam Autoclaving following manufacturer’s instructions is the preferred sterilization technique, as it minimizes degradation of the insert’s materials. “Chemical Vapor” sterilization may also be used. “Dry Heat” or “Cold Sterilization” are not recommended, as they may not be as effective, and may cause the O-ring to deteriorate. Gravity Displacement: 15 minutes @ 132-135º C; 15 minutes cool down. Prevacuum: 4 minutes @ 132-135º C; 15 minutes cool down. Parkell ultrasonic inserts are warranted against manufacturer’s defects for 90 days from date of delivery. This warranty does not cover insert abuse, acts of God, or tips that have been bent, reground, dropped, or altered in some way. Parkell reserves the right to replace or return the purchase price for defective inserts at its discretion. Parkell cannot assume liability for incidental or consequential damage resulting from the use of the insert. Parkell’s quality system is certified to ISO9001/ISO13485.